Customer reviews have become a powerful force. Statistics say 90 percent of consumers check out reviews before visiting a business, 84 percent trust reviews as much as they trust personal recommendations, and 93 percent state reviews play a role in their purchasing decision. In addition to influencing purchases and impacting your online reputation, customer reviews affect your search engine optimization. Incorporating customer reviews into your SEO strategy can give your brand a major boost across the board. People tend to head to customer review websites once they’ve already decided what they need and are looking for a business to fill that need. Upon reading a review, consumers make a near-instantaneous decision if a business or product is worth pursuing. While a negative review may turn people off quickly, the majority of consumers read at least four reviews before they feel confident enough to trust a company. Your website and blog may be stocked with valuable content that talks about how terrific you are. But your own boasting can’t compete with a positive review from a customer. Positive customer reviews rank as your top source of user-generated content about your business, each one providing a valuable, trusted source of information. Praise from customers carries more weight than self-praise ever could, influencing other consumers to head in your direction. When customers write reviews, they tend to use a certain type of language. You’ll find phrases like “best inbound marketing company I’ve ever worked with.” As your company starts to get clicks from review site links that contain such phrases, Google and other search engines start to associate your company with those positive phrases. Social conversation refers to engagement and interactions on social media, and you can enhance it by incorporating customer reviews into your social strategy. Showcasing how other people feel about your products or services can make the products or services more popular, increasing social conversation as well as overall sales. Search engine algorithms favor websites with high ratings, and your ratings can soar with help from good reviews. Not only do positive reviews increase your authority and social proof, but they contribute to ratings on their own. Review signals account for nearly 10 percent of the total ranking factors algorithms use. See Also: Are Algorithms Bad for Marketers? When your company shows up in search results with a star rating displayed, people can instantly determine if they trust your products or services enough to head to your website. Companies with high star ratings displayed by their name can enjoy an increase in traffic and possibly even sales. Google determines your star rating by reviewing specific review sites, looking for companies that have at least 30 unique reviews over the past 12 months and an average star rating of 3.5 or higher. It’s up to Google if those star ratings appear next to your company name, and you can check out Google review info to see if your company is eligible. Although people don’t tend to click on negative review links to do business, they do like to click on them out of curiosity. Make it easy for customers to leave reviews, supplying links directly to review sites. Ask people for reviews, providing directions on how to leave one. Send out review requests and incorporate the ask into your customer checkout process. Choose the right time and the right people, such as regular customers instead of one-time buyers. 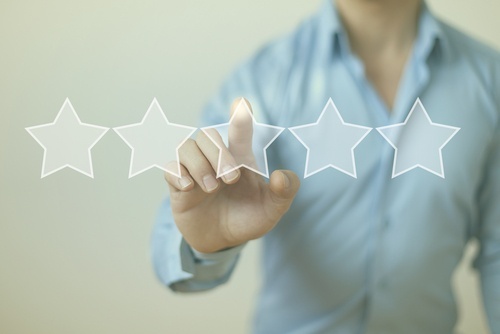 Consider rewarding customers for leaving reviews, which can serve as prime encouragement. Making the most of good reviews involves creating a strategy so you’re never leaving your brand’s reputation to chance. Track your reviews and take action to consistently improve your ratings. Read and respond to all of the reviews, thanking people for the positive and apologizing to those who had negative experiences. Use negative reviews as an opportunity to identify issues that need correcting. Customer reviews have become a crucial element for search engine optimization, ranking right up there with on-site optimization. Taking advantage of their power starts by incorporating them into your overall SEO strategy to reap all the benefits they can bring.